Richard Browne, Director of L&M Keating has been awarded the prestigious the title of Engineers Ireland, Chartered Engineer of the Year for 2015. The accolade is Engineers Ireland’s most prestigious individual award. Richard was shortlisted from over 500 Chartered Engineers across all engineering disciplines in multiple industries and organisations throughout the country. 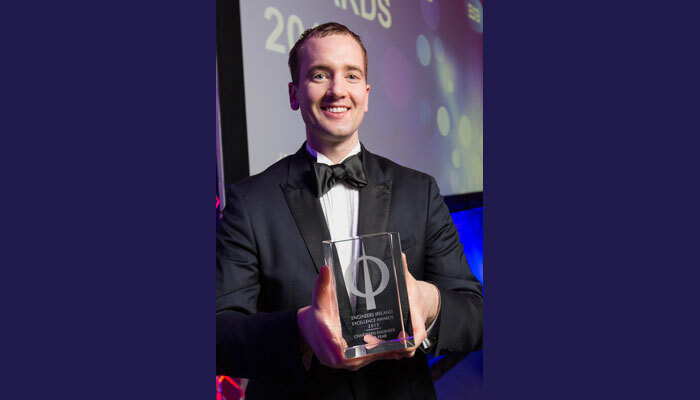 Richard was unanimously declared the winner by a panel of 4 judges in an intense final round of interviews and presentations held last month in Engineers Ireland headquarters at Clyde Road, Ballsbridge. The announcement was made at the Engineers Ireland Excellence Awards ceremony in the Intercontinental Hotel, Dublin on the 6th November 2015. Richard has managed some of the L&M Keating’s most technically challenging marine civil engineering projects, particularly in the design and build sector. His experience covers a wide variety of projects including coastal, bridges, piling, dredging and conservation. Such projects include Rossaveel Floating Ferry Terminals and Knightstown Floating Concrete Harbour. In the course of this award Richard presented one of the company’s most challenging marine projects to date, Cape Clear Island Storm Gates. For this project, L&M Keating offered an innovative contractor designed solution to a unique challenge. Richard and his team elected to precast the largest element, the concrete lock chamber off-site on the mainland. The 15x15x9m high, 1000t structure was cast in and successfully floated from Verolme Drydock, Cobh over 130km to Cape Clear Island. It was then sunk into position on foundations up to 7m under water. His team then installed a set of sophisticated computer controlled mitre storm gates which includes two 30t gate leaves each operated by 140t hydraulic rams. This novel solution ensured that the vital island harbour could remain open throughout the construction programme. The solution also minimised underwater construction works and thus improving build safety. In his address to the 400 delegates at the ceremony Richard outlined the challenge of ensuring this 1000t chamber ‘arrived on the right day, at the right stage of the right tide, with the right weather conditions to slot the chamber into exactly the right spot a 2 hour tidal window. ‘I’m thrilled with the win, it’s fantastic recognition of the hard work our team do here at L&M Keating. We have great people delivering really innovative, challenging building and marine projects throughout the country and we don’t shout enough about it!’ Richard said. The project has proved to be a great success and today provides protection to the critical harbour infrastructure and safety to the islanders fishing boats and passenger ferry. L&M Keating have also been appointed to phase 2 of the project which will be completed by the end of the year.